A blend of elegance and opulence you have never seen before. Ensemble in a dreamy and elegant shade of blue would make for the ideal reception outfit. Sky blue flared lehenga flaunts intricate and opulent workmanship with zardosi, zari, stones, light and dark blue resham embroidered floral pattern. Hem of the lehenga includes navy blue velvet patch with intricate floral pattern features resham, zardosi and stones. COMES WITH A MATCHING CHOLI SIMILAR TO THE LEHENGA. 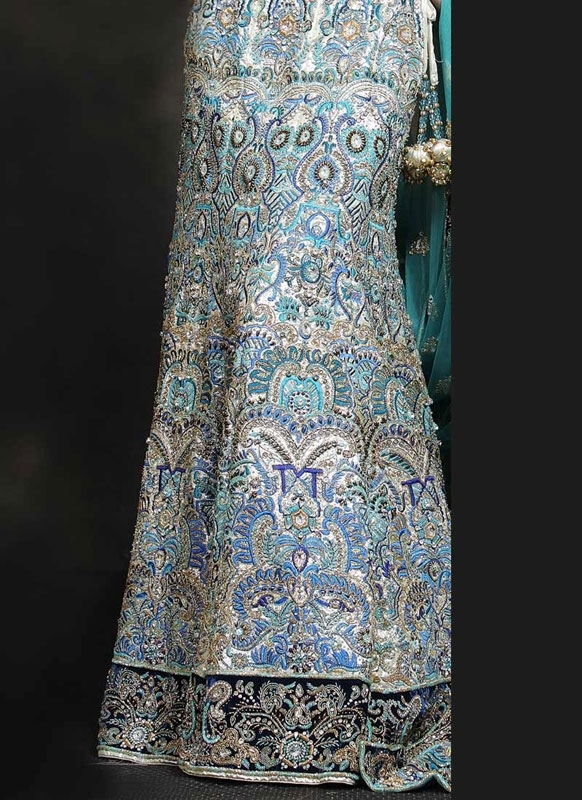 Comes with a beautiful blue net dupatta with embellished motifs. Embellished navy blue velvet panels, similar to that of the lehenga, adorns the borders of the dupatta. A lama lehenga choli with net dupatta.